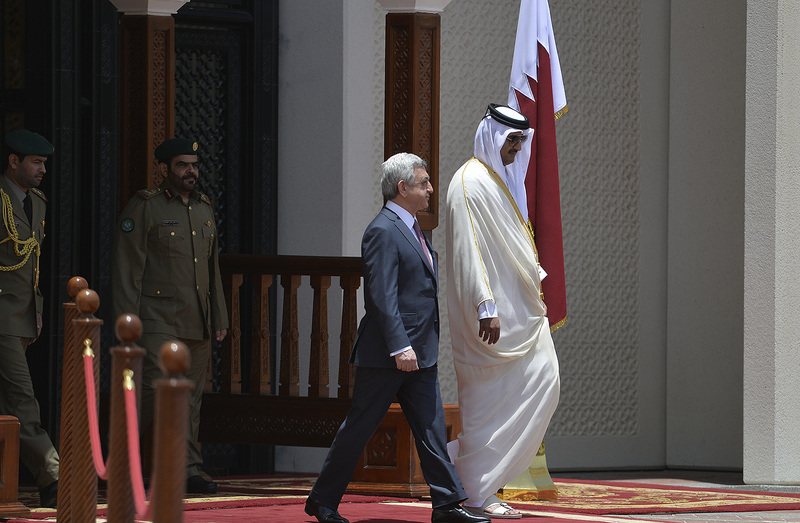 President Serzh Sargsyan, who is in the State of Qatar on official visit, had a private meeting with the Emir of Qatar Sheikh Tamim Bin Hamad al Thani. 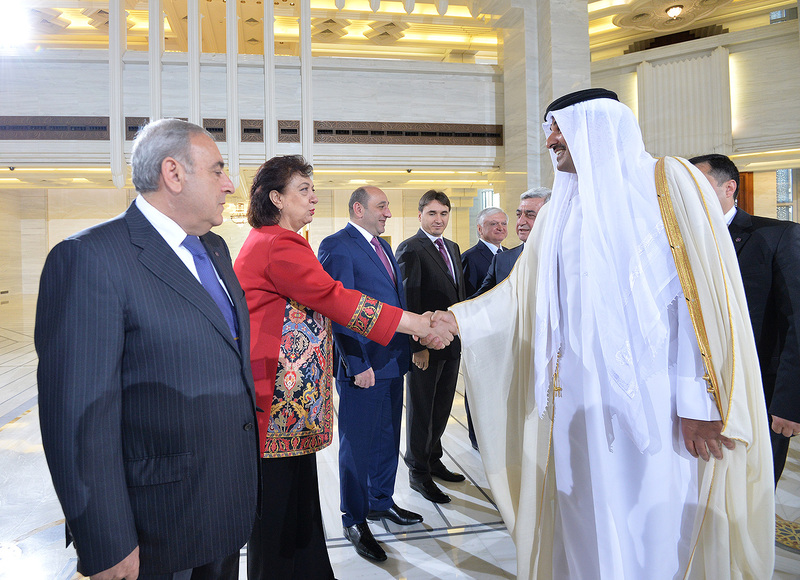 Before that, the official ceremony of welcoming the President of Armenia took place at the Emiri Divan. 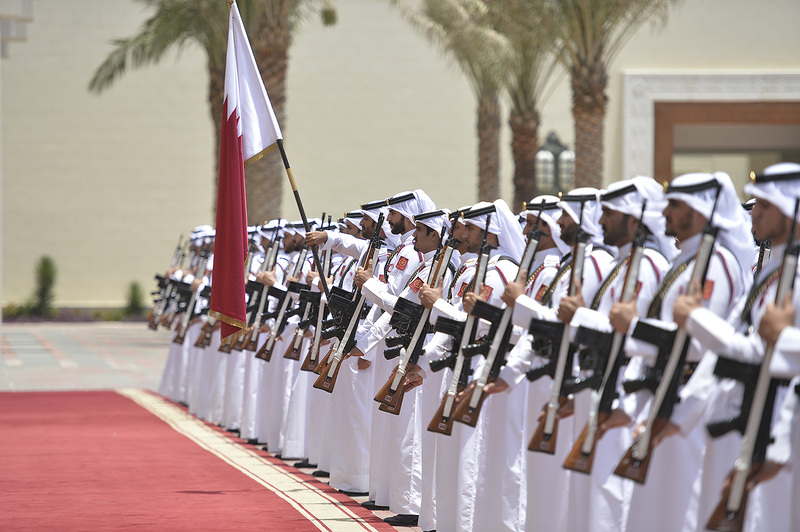 At the meeting, the President thanked the Emir for the invitation to visit the friendly Qatar and the warm welcome extended to his delegation. 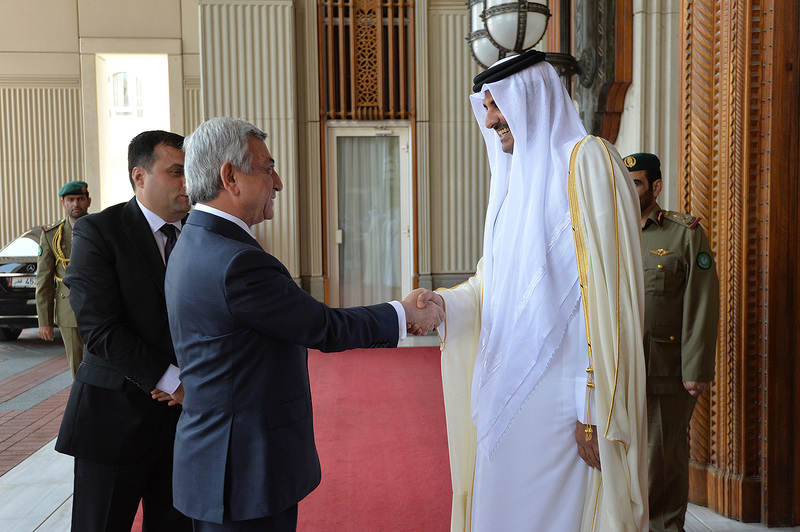 Noting that Middle East is holding an important role on the foreign agenda of the Republic of Armenia and that Armenia has special relations with the Arab states, which are based on the centuries-long friendship, Serzh Sargsyan noted that our country is interested in the invigoration of the high-level political dialogue with the State of Qatar and deepening of cooperation in all areas. 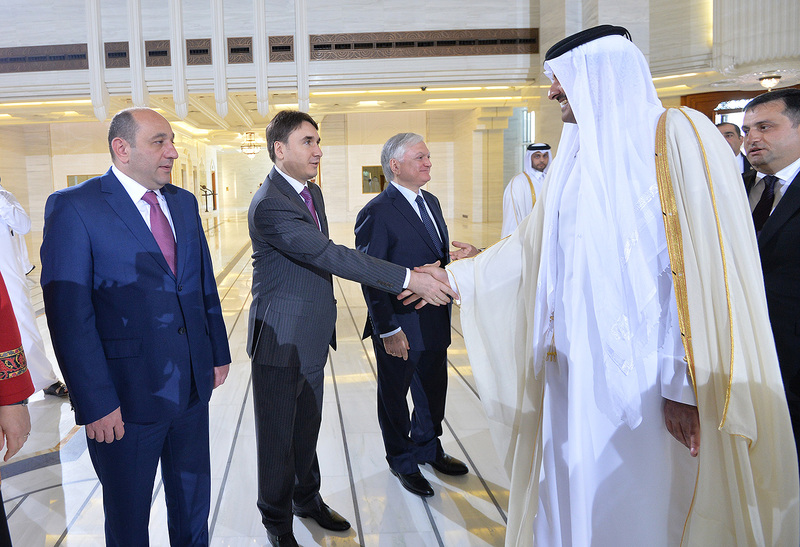 The parties expressed hope that the results of President Sargsyan’s first visit to Qatar will bring their input to the development of the Armenian-Qatari relations. 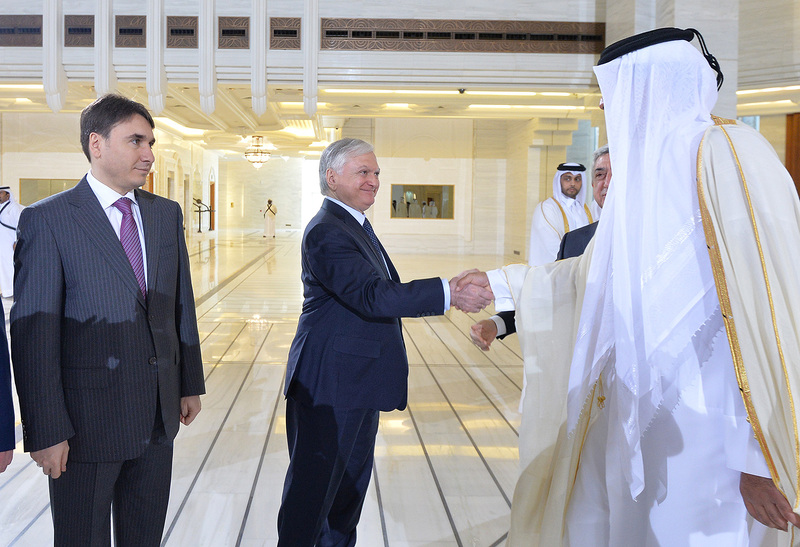 They viewed as symbolic the fact that the visit is taking place in the year which marks the 20th anniversary of the establishment of diplomatic relations between Armenia and Qatar which, accordion to the parties, presents a good opportunity to re-evaluate the Armenian-Qatari relations and give them a new impetus. 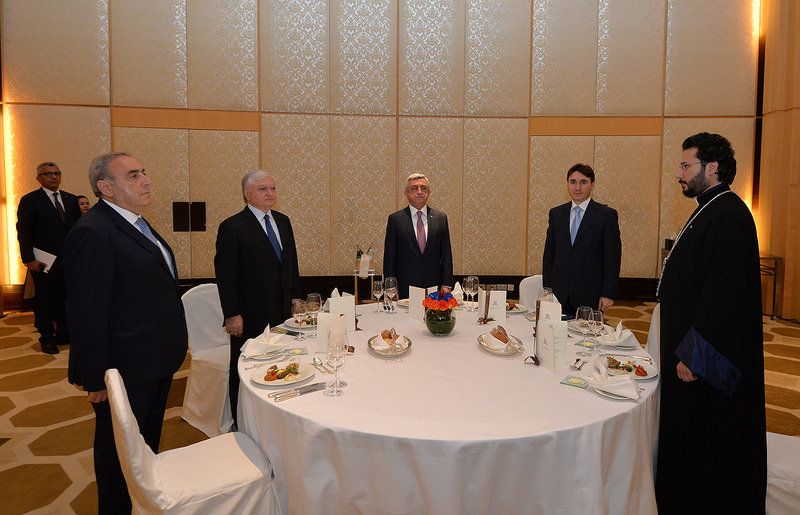 In the context of developing the bilateral cooperation, the parties stressed the importance of political contacts, particularly with regard to the consultations between the ministries of foreign affairs of the two counties which will allow to exchange views on the development of bilateral relations, situation in the region, issues, which are sensitive to the parties, and positions. 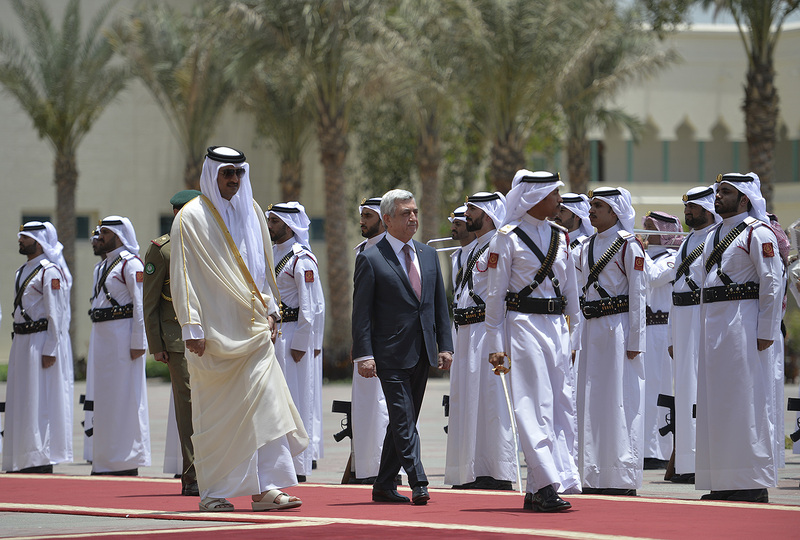 Noting with satisfaction that the number of visitors from the countries of the Persian Gulf, including Qatar, to Armenia increases by year, which is promoted greatly by the flights operated by the Qatari airlines, the interlocutors discussed the opportunity of the liberalization of the visa regime between the two countries and prospects of deepening the interaction with the Qatari airlines, aimed at the enhancement of the mutually beneficial cooperation. 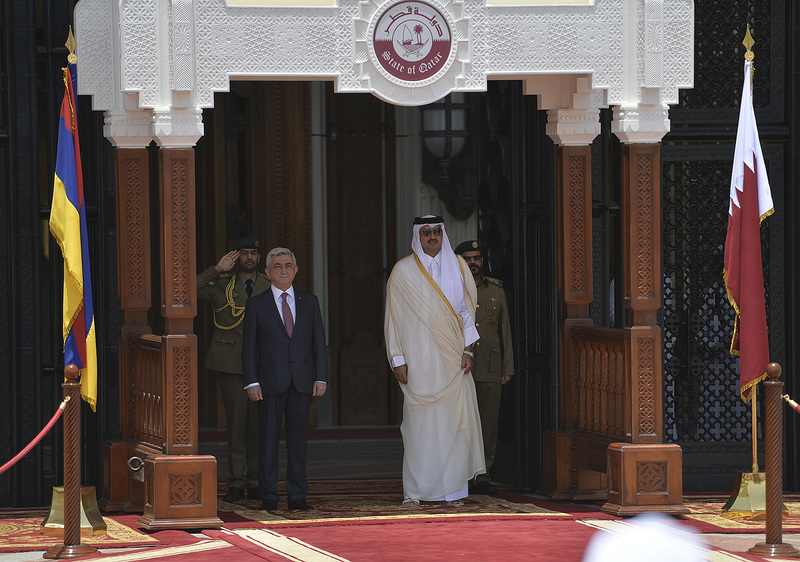 From the viewpoint of boosting the mutually beneficial trade and economic relations, the President of Armenia and Emir of Qatar stressed the importance of expanding the legal field of the two countries as well as holding session of the intergovernmental commission. The Armenian side proposed for consideration a number of investment projects in different areas, among them the use of Armenia’s transit opportunities, especially access via Armenia to the countries of the Eurasian Economic Union. 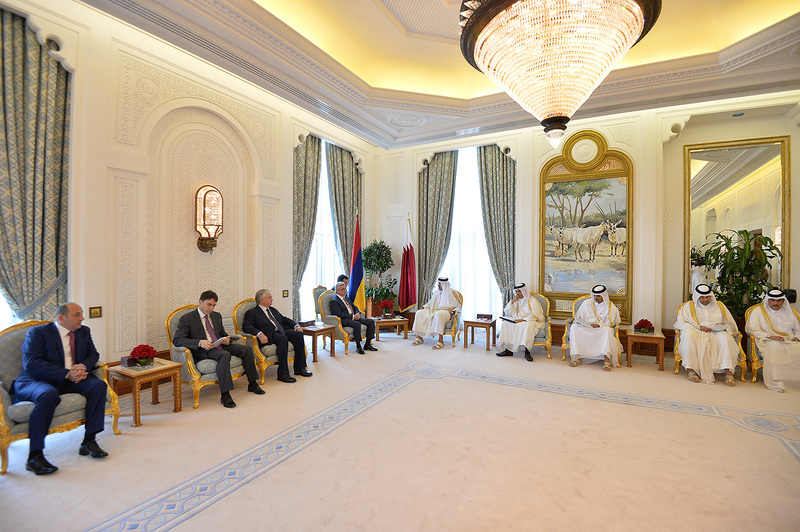 At the proposal of the President of Armenia, the Emir of Qatar instructed the Minister of Economy of Qatar, who is also is the Vice President of Qatar’s investment organization, to have a separate meeting with the RA Minister of Economy, who is part of the Presidential delegation, and to discuss in detail the prospects and potential of the development of the bilateral economic ties. 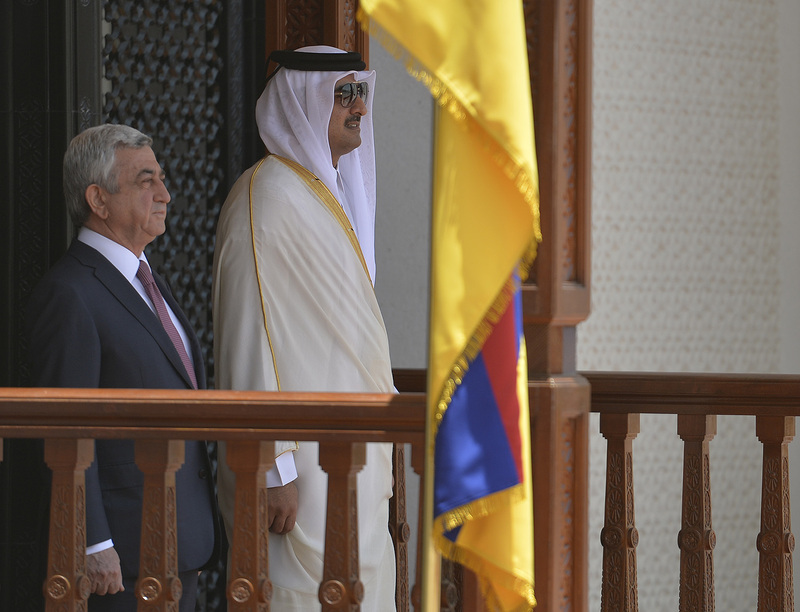 The representatives of the aviation agencies of the two countries were instructed by the President of Armenia and the Emir of Qatar to hold similar meetings in the framework of the visit. 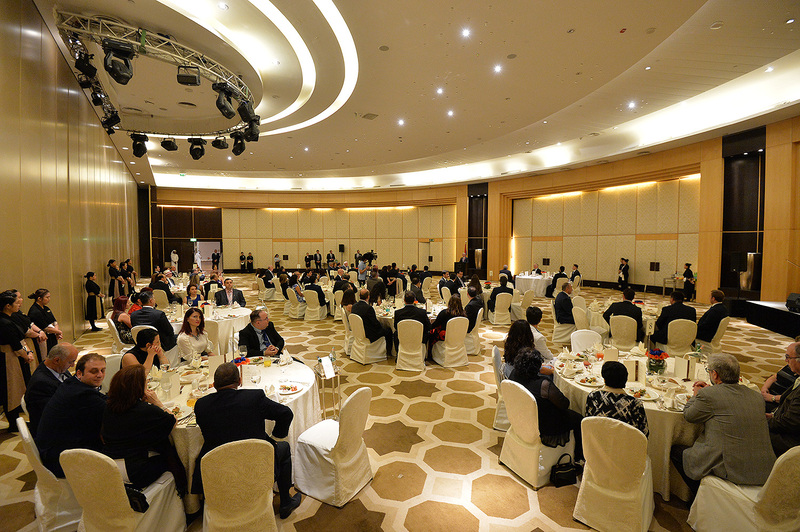 Along with the bilateral relations, the parties discussed also possibilities of cooperation in a multilateral format. 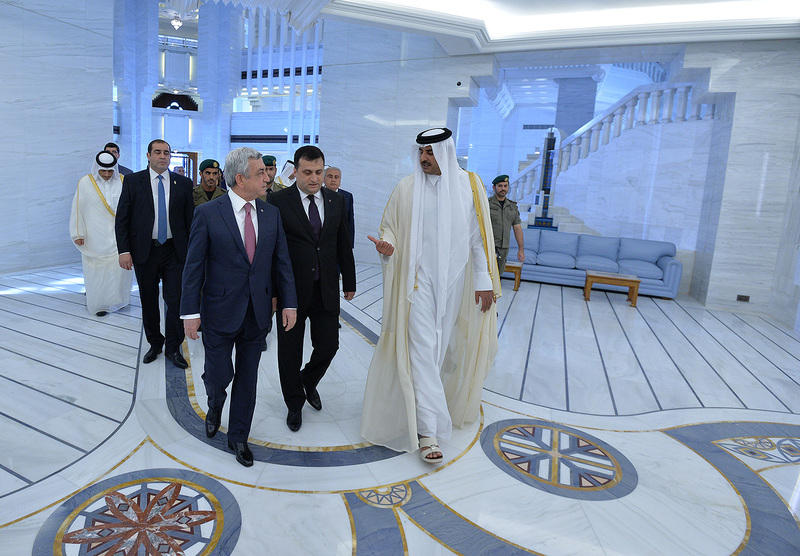 President Serzh Sargsyan and Emir Tamim Bin Hamad al Thani spoke also about the NK peace process. In this context, the Emir stressed the importance of establishing peace and stability in the region and underscored that there is no alternative to a peaceful resolution of the NK conflict and a dialogue. 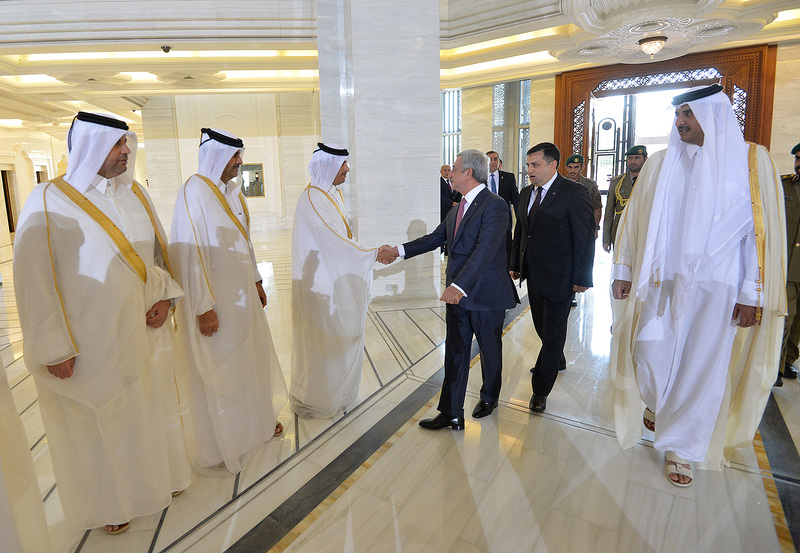 After the meeting, Emir Tamim Bin Hamad al Thani hosted an official reception in the honor of the President of Armenia. 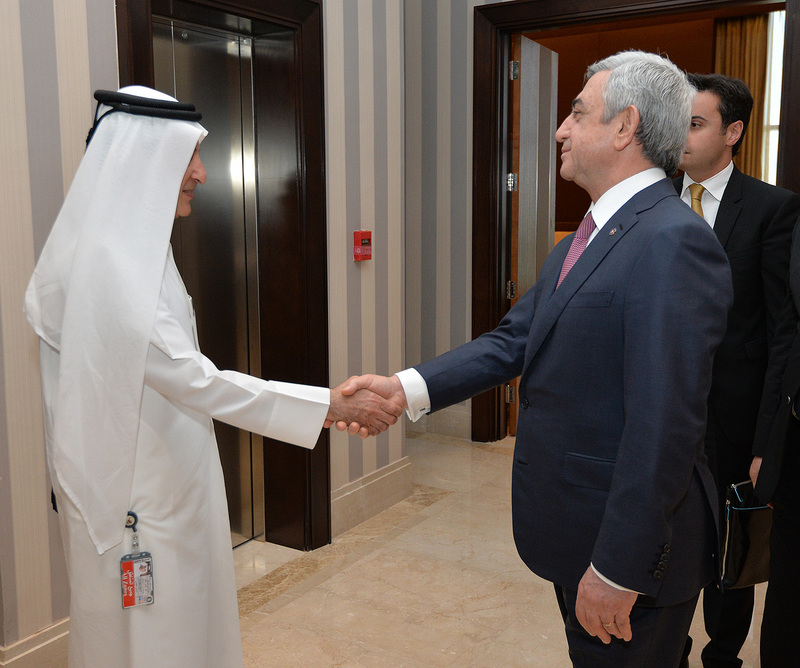 In the framework of his official visit to the State of Qatar, President Serzh Sargsyan met with the CEO of Qatar Airways Akbar Al Baker. 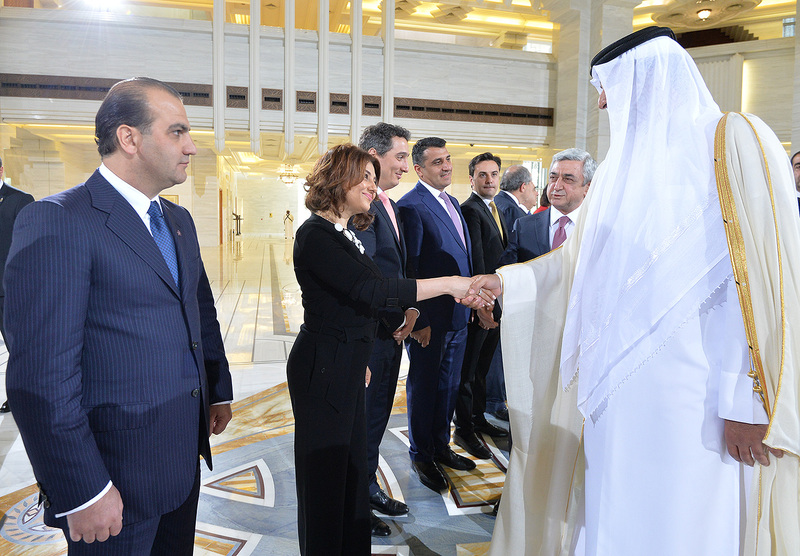 The parties discussed the process of the Armenian-Qatari cooperation in the area of aviation and prospects for development. 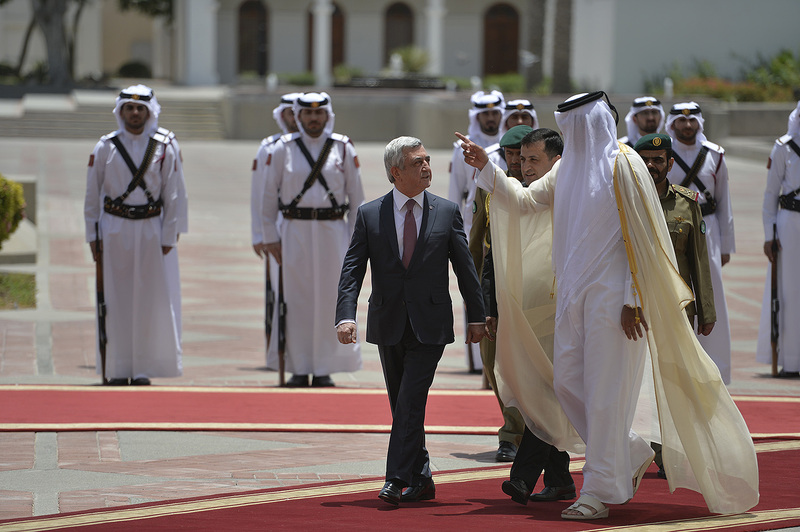 President Sargsyan spoke about the significant role of the flights carried out by Qatar Airways in the expansion of the agenda of the interstate bilateral cooperation. Qatar Airways entered the Armenian aviation market in May 2016 and is carrying out Doha-Yerevan-Doha regular flights. According to the President, the increase of the number of tourists from the countries of the Persian Gulf, including Qatar, is also conditioned by the existence of direct flights. 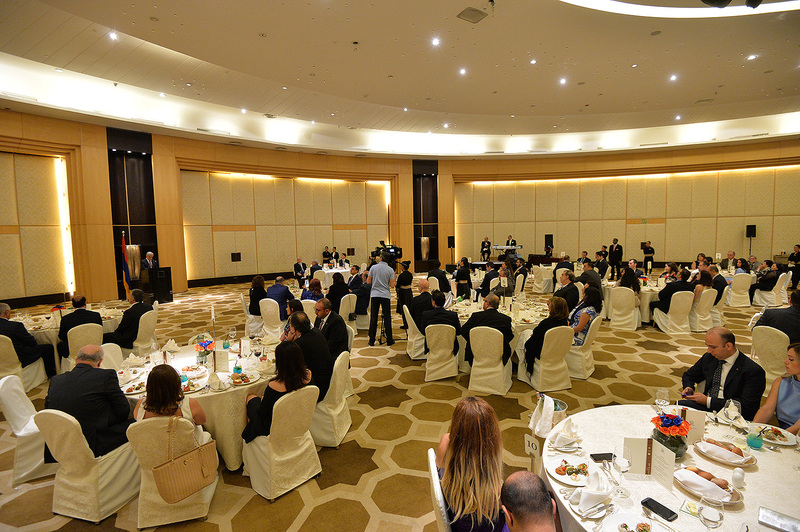 Noting that Armenia adopted Open Sky policy in 2013, President Sargsyan underscored that Armenia’s policy in the area of civil aviation and air communications provides new opportunities to the Armenian and foreign companies and ensures equal and free competition field for all. 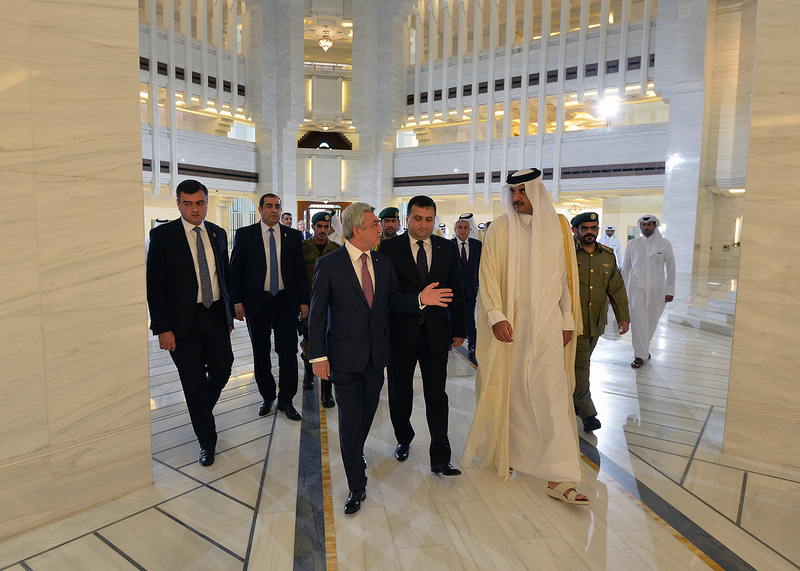 Serzh Sargsyan noted that Armenia will encourage and support Qatari investors to make investments in different areas of the Armenian economy, including the aviation area. 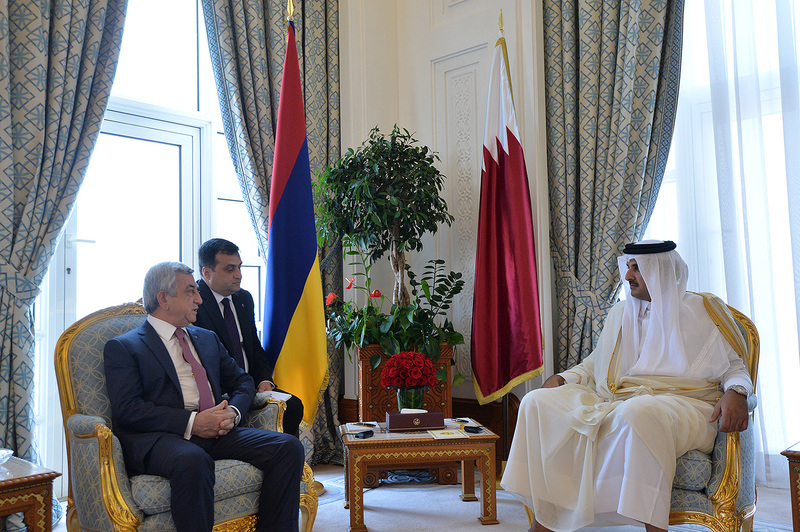 The CEO of Qatar Airways informed President Sargsyan that he has already received instructions from His Majesty the Emir of Qatar to develop cooperation with Armenia in the area headed by him and assured that he would do his best to fulfill the task. Akbar Al Baker noted that his company sees prospects for the development of the cooperation and is striving to promote the mutually beneficial cooperation. 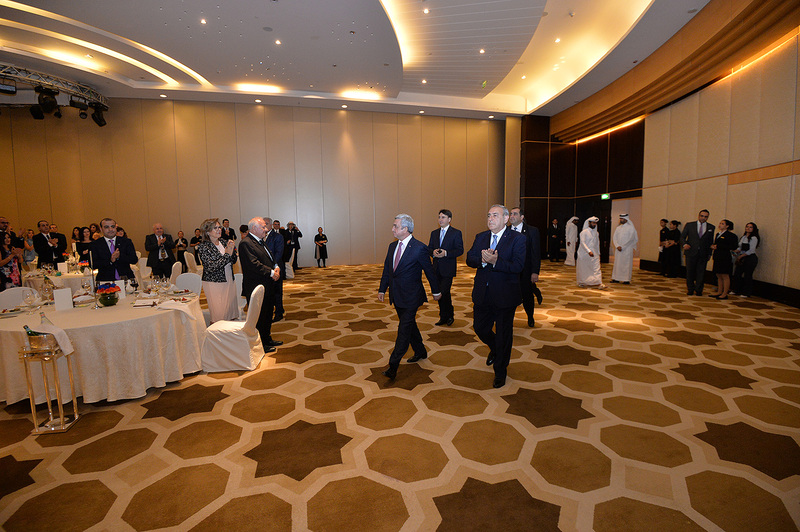 President Serzh Sargsyan, who is conducting an official visit to the State of Qatar, met with the representatives of the Armenian community of Qatar. 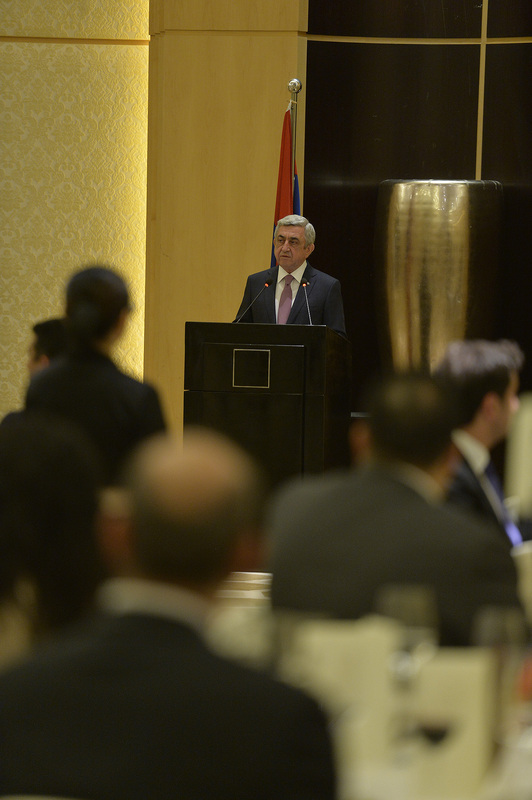 The President of Armenia addressed the audience. 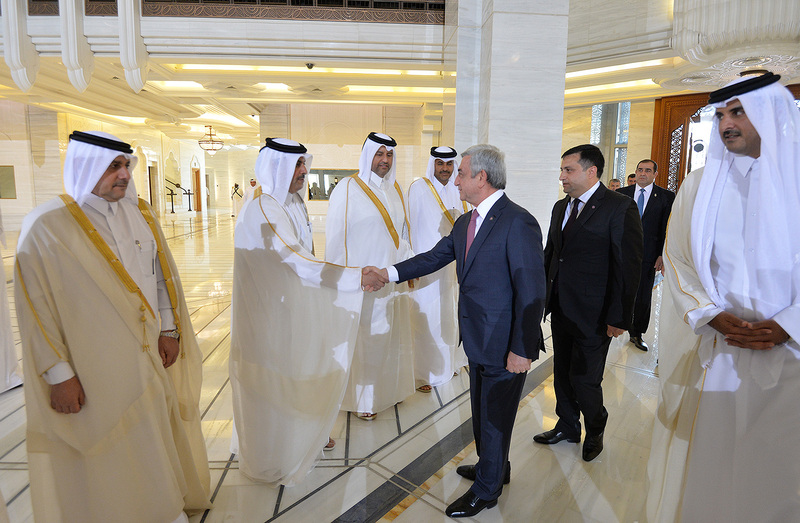 Noting that he was glad to have this opportunity to meet with the representatives of the newly established, small but robust Armenian community, Serzh Sargsyan commended the fact that residing and working in Qatar, the Armenian community makes its input to the development of Qatar, preserving at the same time Armenian national spirit and identity. In this context, President Sargsyan stressed the important role of the Mesropian day school. 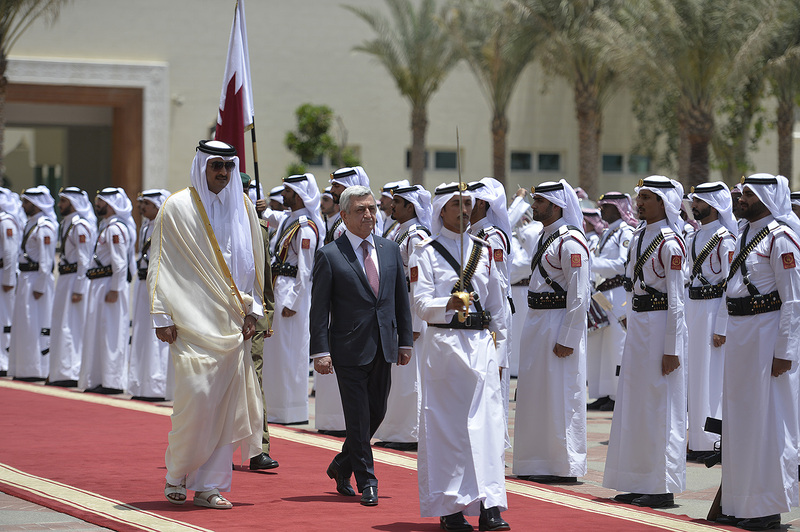 According to the President, under current conditions, the existence and prosperity of the Armenian communities in the countries of the Persian Gulf acquire a new value. 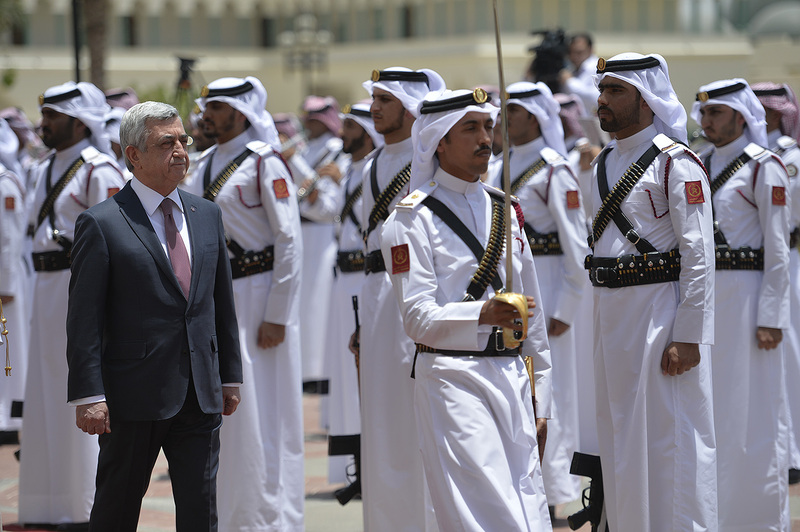 Serzh Sargsyan expressed confidence that there is great untapped potential in the Armenian-Qatari relations, and with the assistance of the local Armenian community efforts should be made to give a new content to these relations. 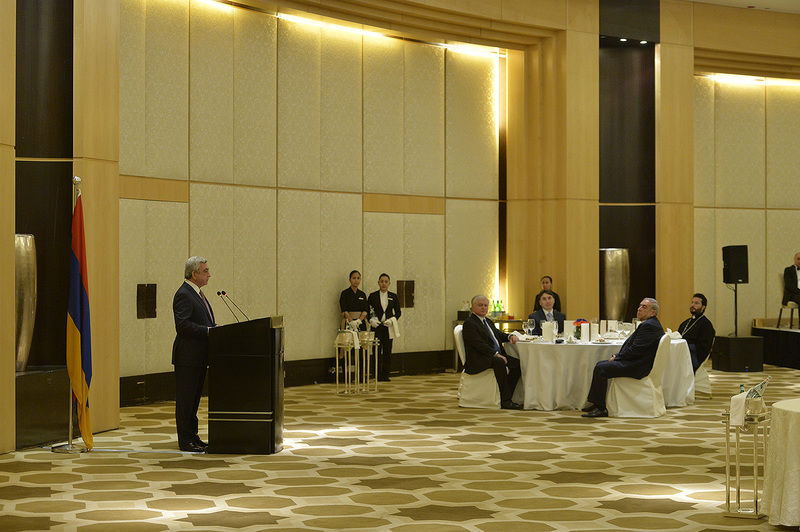 In his remarks President Sargsyan spoke also about the NK peace process, presented the approaches of the Armenian side and concerns currently present in the resolution process. 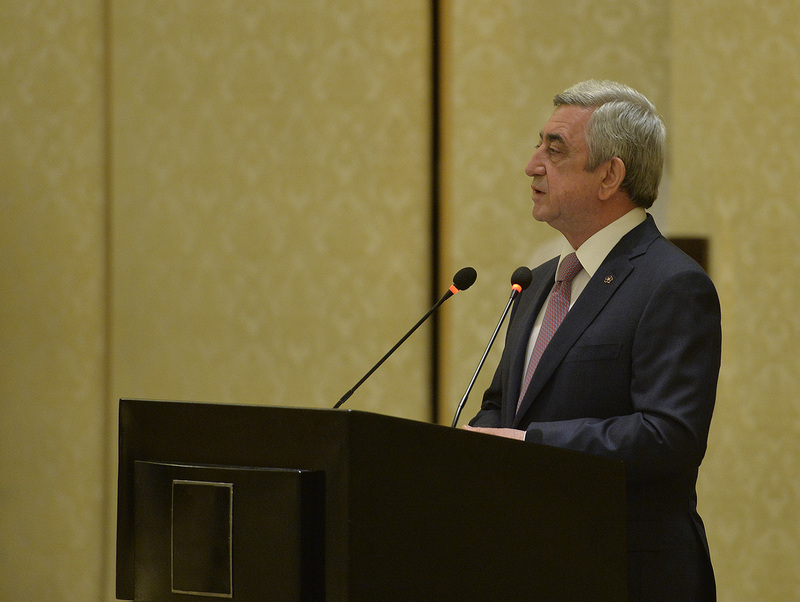 “Today too, I would like to state for all world to hear that though we value peace, we will not hesitate for a moment to become a fist again and stand by the just demand of the people of Artsakh as we did twenty-five years ago, as we did last April,” underscored Serzh Sargsyan. 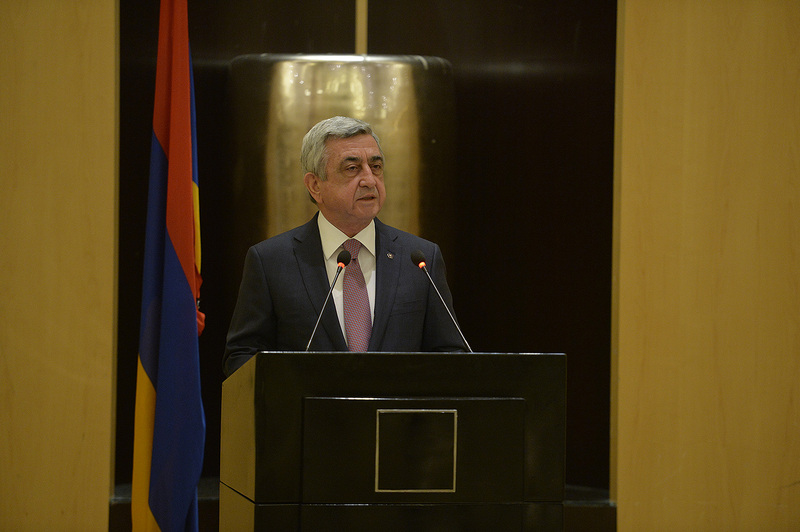 President Sargsyan spoke about the process of the international recognition of the Armenian Genocide and the events going on in Armenia now. “I am confident you are following all events happening in Armenia, rejoicing for each our achievement and feeling sad for our failures. I believe today you are happy that the reforms, which have been going on in our country for a while, have finally yielded results. I am speaking, of course, of the recent parliamentary elections which have received positive assessments of all international structures. But it’s not the end, not at all. As I have stated on many occasions, this is a new beginning which is even more compelling. We will take up reforms our country with new vigor, also relying on your potential, your knowledge, your talent: We have the same goal – a powerful and stable Armenia. As at every stage of our history, today too, the strongest guarantee of the existence and development of the Armenian nation is our unity. So, let’s put all our efforts, strength and strength, abilities and talents into developing and empowering the Armenian state, not only staying Armenians and bringing up generations of Armenians, not only through patriotic deeds and Armenia-oriented activities but also through the introduction and implementation of economic projects, even minor projects, even small projects. 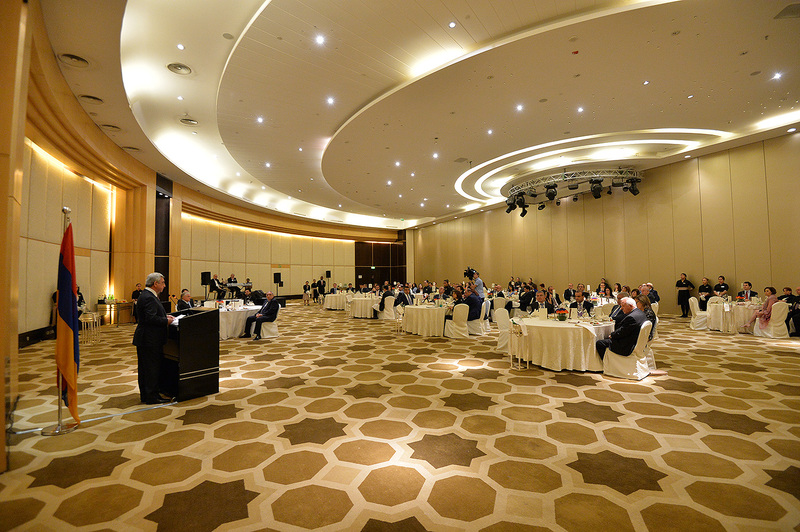 Let us pave the way for the eternal existence of the Armenian nation together,” President Serzh Sargsyan said at the meeting with the representatives of the Armenian community of Qatar.